Jeff Jones and his daughters feed grain to their foraging cattle once a day in Callaway County, Mo. They're concerned about the health and environmental effects a potential hog farm next door might have. But although the "right to farm" provision is focused on agriculture, it has pitted farmer against farmer, with some worried that the results could change the face of farming in the Midwest. On one side: commodity groups, like the Missouri Farm Bureau, the Missouri Cattlemen's Association and the Poultry Federation. On the other: animal rights groups, like the Humane Society of the United States, and some small farmers. Jeff Jones, a fourth-generation farmer in rural Callaway County, Mo., is worried. A new industrial hog farm is trying to move in less than half a mile away; the 20-acre lot would pack in more than 10,000 hogs. Jones says he's concerned how it will affect the health of his livestock and family. "Much of the fertilizer will be spread on the land, which will be uphill from us," he says. "So when large rains [come], there's going to be concerns about that coming down here and being in the water and the creek and the ditches." It's a common story: Large-scale farming and neighbors don't always mix. But Jones is worried that he won't be able to hold the hog operation accountable for problems. That's because Missouri voters narrowly approved Amendment 1. It says in part, "The right of farmers and ranchers to engage in farming and ranching practices shall be forever guaranteed in the state." Jones and others worry, however, that it could give more power and influence to large farms and wealthy corporations at the expense of smaller operations. 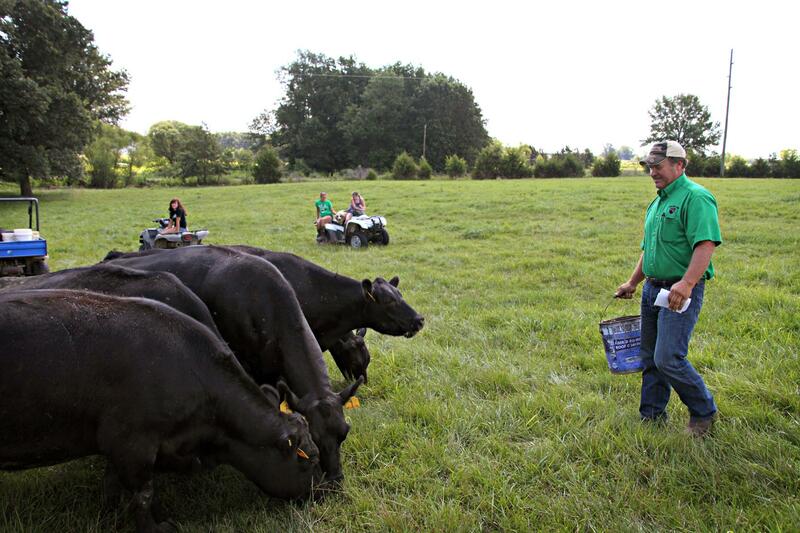 The Missouri measure essentially attempts to protect farmers and ranchers from any new laws that would change or outlaw practices they currently use. "[These] practices that are proven, that are safe, that are good for consumers, good for farmers and good for the environment," says Blake Hurst, president of the Missouri Farm Bureau, which has spent heavily on advertising supporting the amendment. If the provision is adopted, some say, it will be harder to bring public pressure to farms that harm the environment. It may also be harder to pass legislation restricting how farmers operate. Hurst says he wants to stay one step ahead of the groups that use regulation to change the way farmers do business. Some Midwest farmers say recently they feel under attack from animal welfare groups and environmental organizations. They're worried about their livelihood. "So this amendment is a way for us to push back a little bit," Hurst says. University of Missouri law professor Erin Morrow Hawley says if it passes, it will likely lead to interpretation issues down the road. "It talks about 'farming and ranching practices,' " Hawley says. "So that's a rather general term and will be left up to the courts to decide what that encompasses." Now under the amendment, farms still have to abide by existing laws and environmental regulations. But critics, like farmer Jake Davis, say a "right to farm" provision makes Missouri friendlier to large farm companies with deep pockets. Two years ago, North Dakota passed a similar right-to-farm amendment. North Dakota State University law professor David Saxowsky says he hasn't seen any resulting court cases. "Maybe sometime in the next decades there will be some technology that even producers will say, 'Hey, wait, we really aren't sure if we want that within our industry.' And at that point, this language will be tested," Saxowsky says. Other states are looking at measures like the ones in Missouri and North Dakota. Indiana recently added right-to-farm legislation in the form of state law. Oklahoma had legislation that just didn't make it out of the General Assembly. In other Midwest states, conversations about right to farm are stirring up. In the meantime, farmer Jake Davis says regardless of the vote's outcome, the public is paying attention now. "If nothing else, we're victors tonight because we have brought the issue of sustainable agriculture vs. corporate agriculture to the forefront." Ultimately, he says, Missouri may have set the tone for how other ag-centric states tackle their own version of the right to farm. Kristofor Husted is a reporter for Harvest Public Media based at NPR member station KBIA in Columbia, Mo. Copyright 2014 KBIA-FM. To see more, visit http://www.kbia.org.